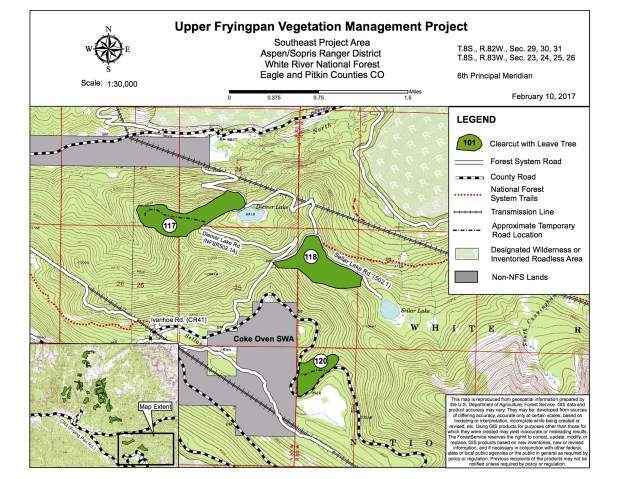 The map shows where the logging would occur in relation to Diemer and Seller Lakes in the Upper Fryingpan Valley. Timber removed from those units would be hauled down the Fryingpan Valley through Basalt. A U.S. Forest Service proposal for a logging project in the Upper Fryingpan Valley was hit with a barrage of objections from property owners, conservation groups, a logging business and spelunkers. There were 11 objections filed, but two of them were on behalf of multiple parties. The Roaring Fork Audubon Society said clear-cutting and selective removal of trees on 1,759 acres of the forest would devastate too much bird habitat. 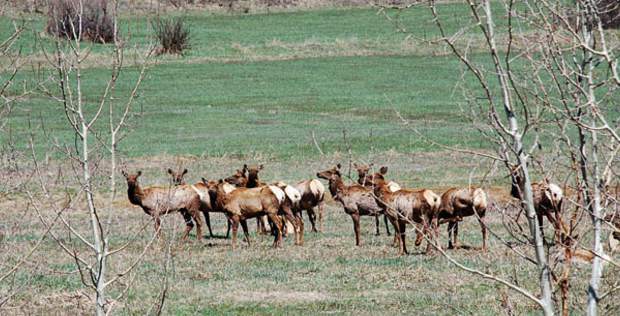 Carbondale-based conservation group Wilderness Workshop wants the size of the project reduced to eliminate negative ecological effects. Basalt town government contends the project will send too many logging trucks lumbering down Frying Pan Road and through the streets of Basalt during the busy summer season. It wants a portion of the project eliminated to reduce truck traffic and it wants hauling to be reduced to one year, with limited hours. On the flip said, Montrose Forest Products LLC said the Forest Service is applying too onerous of rules to the project. “Given the restrictive nature of many of the individual design criteria, plus the cumulative impact when all are considered, and the long haul distances to existing markets, it simply may preclude economical operation of the proposal timber sales in the Upper Fryingpan,” the company said. The project area is north of Frying Pan Road to the east and northeast of Ruedi Reservoir and to the south and west of the Harry Gates Hut, part of the 10th Mountain Division network of backcountry ski cabins. Logging around Seller and Diemer Lakes would require logging trucks to travel down the Fryingpan Valley and through Basalt. Arvada resident William Green filed an objection that said he is alright with the logging but fears the Forest Service will use the project to close down access roads and trails in the national forest. “The problem, as I see it, was that the U.S.F.S. never mentioned that when they completed their logging project they would then proceed to intentionally tear up, close and destroy roads and jeep trails that give us access to our national forests,” Green wrote. Fryingpan Valley resident Barry Rabe and Jim Lawton, a member of the National Speleological Society, lobbied the Forest Service to leave one specific site in the project area alone because of its unique karst geology. The terrain has sinkholes and caves. “This area is already the epitome of forest health,” Rabe wrote. Two of the objections were on behalf of more than 10 parties each. The Swomley family, owners of property at 26611 Frying Pan Road, filed a legal brief type of objection that zeroed in on numerous points of the Environmental Assessment and draft decision by the Forest Service. One point of concern was the logging project’s effects on wildlife habitat. 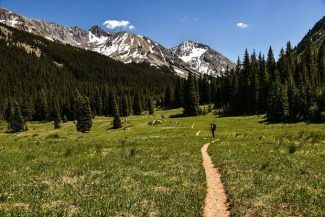 An objection by Rocky Smith, a veteran conservationist in Colorado, was made on behalf of 12 property owners or conservation groups, including Rocky Mountain Wild and a chapter of Great Old Broads for Wilderness. One point in that objection was the Forest Service view of alternatives was too narrow — just no action and the proposed action. The agency should have looked at an alternative to clear cutting that would limit treatment to vegetation management around pickets of private land surrounded by national forest. That would help create defensible space around private homes, the objection said. Smith’s objection also said the proposal would affect habitat for the northern goshawk, lynx and red squirrel. The Forest Service is reviewing the objections and hasn’t reached its deadline to answer yet. 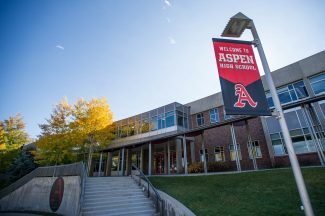 Aspen Sopris District Ranger Karen Schroyer signed a draft decision in December to allow the vegetation management project over what would likely be a five-year period. The Forest Service conducted an Environmental Assessment of its proposal and concluded the project would increase the age and size diversity of the forest in that area, making it less susceptible to disease and infestation and reduce the risk of wildfire. The project would improve snowshoe hare habitat, which would benefit the federally threatened Canadian lynx, according to the document. It also would supply wood products, part of the Forest Service’s multiple-use plan for public land. A regional review team for the Forest Service is working on responses to the objections. That review includes determining if the parties have legal standing to make an objection. Only the parties that submitted comments on the draft Environmental Assessment were able to file an objection, according to federal rules. The Forest Service has the opportunity to hold an objection resolution meeting with parties that objected. Once the review is complete, the team will make a recommendation to Scott Fitzwilliams, White River National Forest supervisor and the reviewing officer for the project. “He can choose to accept the project as is, require more analysis or alter the decision,” Jerman said.